The MMA amateur competition glove is ideal for mma competitions and for training safely. The mma�gloves weigh 8oz and are fastened with velcro. 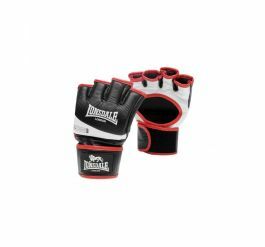 The Lonsdale competition mma glove has pre-shaped padding to ensure the glove is not too stiff and has the right fit for your knuckles. It has an open palm to make sure the hands are still free for grip training. The gloves have a leather outer layer and double stitched velcro straps.